Maserati is celebrating its victory in the 2005 FIA GT Manufactures' Cup with a limited edition Maserati GranSport that boasts a range of features that link it to the world title-winning Maserati MC12. 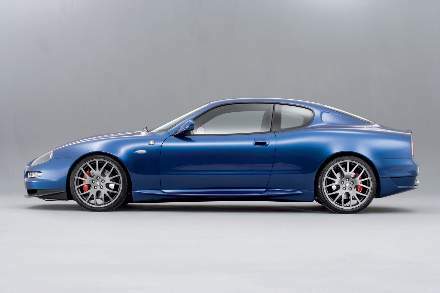 Set to be launched at the Geneva International Motor Show on 2nd March 2006, the Maserati GranSport MC Victory will be strictly limited to a total production run of 180 cars, with just five tagged for sale in Australia and New Zealand. Externally, the Maserati GranSport MC Victory is immediately recognisable thanks to its aerodynamic, blue carbon front and rear spoilers and the Italian flag embedded in the side panels, another feature taken from the MC12. The Maserati GranSport MC Victory is more than just an equipment package. It benefits from technology and designs developed for the Maserati MC12 racing and road cars. The front splitter of the Maserati GranSport MC Victory has been redesigned to guarantee more negative lift at high speeds with the addition of the two lateral aerodynamic profiles and a larger splitter. The Maserati GranSport MC Victory is even more responsive to steering inputs thanks to more direct and precise steering rack as well as greater stability at high speeds. Where the Maserati GranSport MC Victory differs from the MC12 racing car is inside. The GranSport is no stripped, austere racing machine. The carbon trim elements, similar to the exteriors, are made of blue carbon fibre. This is coupled with a selection of leathers and Alcantara trim, used on the upper dashboard, the door panels, in the central part of the racing carbon seats to emphasise the sporty look and on the steering wheel for grip. "The Maserati victory in the GT Championship was a spectacular return to form for a company whose name is elemental in the history of motorsport," says Edward Butler, General Manager for Maserati in Australia and New Zealand. "The Maserati GranSport MC Victory celebrates this success as only Maserati can, by making key elements of the motorsport car available for road use. The five people in Australia and New Zealand who own these rare cars will not only be lucky to be able to drive such a fine performance car, they will also, indeed, own a piece of history!" Australian and New Zealand prices and full specification of the Maserati GranSport MC Victory will be announced when it goes on sale in the middle of the year.